But, realistically, how many times can you say no when your daughter begs for a pint-size wedding gown or the latest Hannah Montana CD? And how dangerous is pink and pretty anyway - especially given girls' successes in the classroom and on the playing field? Being a princess is just make-believe, after all; eventually they grow out of it. Or do they? Does playing Cinderella shield girls from early sexualization - or prime them for it? Could today's little princess become tomorrow's sexting teen? And what if she does? Would that make her in charge of her sexuality - or an unwitting captive to it? Those questions hit home with Peggy Orenstein, so she went sleuthing. She visited Disneyland and the international toy fair, trolled American Girl Place and Pottery Barn Kids, and met beauty pageant parents with preschoolers tricked out like Vegas showgirls. She dissected the science, created an online avatar, and parsed the original fairy tales. The stakes turn out to be higher than she - or we - ever imagined: nothing less than the health, development, and futures of our girls. From premature sexualization to the risk of depression to rising rates of narcissism, the potential negative impact of this new girlie-girl culture is undeniable - yet armed with awareness and recognition, parents can effectively counterbalance its influence in their daughters' lives. Hide your daughters 'cause it's a big bad world out there in pink taffeta. For the positive, I learned some interesting bits of trivia about Disney princesses and European fairy tales. Otherwise I found it to be a big book of worry that offered few if any solutions of what to do about all the evils of modern American consumerist life that threatens to engulf girls in a pink tide of an unreal sense of self, princess fantasy, and an over reliance on looks over feelings. Okay, it is a dispatch from the "front lines" of girlie culture and not a guide book with any solutions. Best to follow this up with a book by an expert and not a journalist who can help parents move from the battle lines to more peaceful shores. Engaging discourse about gender construction. 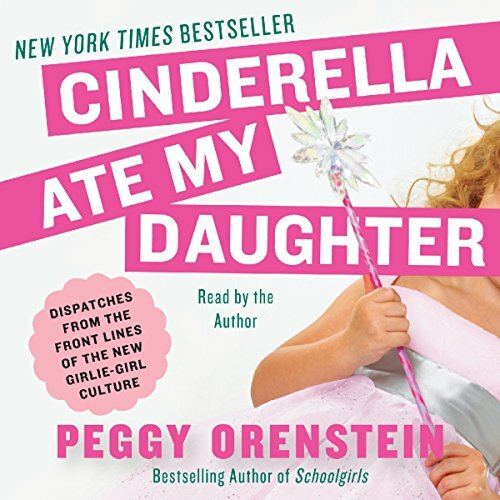 Would you consider the audio edition of Cinderella Ate My Daughter to be better than the print version? Yes, it's a complicated topic, and the author reading the book makes the feminist dialogue easier to understand. It is more like having a conversation with Peggy, discussing opinions of gender instead of reading a long lecture. What was one of the most memorable moments of Cinderella Ate My Daughter? When she discusses allowing her daughter to have choice, instead of coercing her towards commercial femininity or coercing her away from it. I though that was a very relevant and poignant passage as eventually it's a complicated issue and her daughter can be as typically feminine princess-y as she wants. What did you learn from Cinderella Ate My Daughter that you would use in your daily life? That it's important to discuss commercialization of media with your children so they can on some level engage with the socialization of gender, instead of commanding them to present their gender one way or another. Peggy Orenstein once again has hit the nail square on the head. Marketing being the nail that closes the coffin of childhood. Children as such have never had it easy. They were and still are exploited whether by the farm needing hands, the drudge factory of centuries past and now, the hungry maw of salespersons in need of consumers. Where is the line? Should you raise your child as an Amish or Hutterite or, let them slide into a life that will forever feed the giants of industry? Our country survives on capitolism creating jobs and selling product. Talk about a two edged sword. As an old feminist I thank you Peggy Orenstein for trying to make sense of this crazy world. are we limiting or broadening girls' options? Unlike some authors, Orenstein does a great job reading her own work. But this is actually a book you should read, underline, and take notes on, then reread. Then apply. Orenstein is a great writer and has done homework to write this book, read research, psychological treatises, learned the history of baby dolls and Barbie dolls, done interviews with girls and their moms, experts on many subjects, and even analysed current and original versions of fairy tales. Her analysis goes off into many, many areas, but always the question is Does this give girls more choices or fewer? Do current trends oversexualize girls, and how do females then develop healthy sexual relationships? *Princesses avoid female bonding. Only one girl can reign. *The pink preponderance "fuses girls' identities to appearance." *The current brainless glut of princess things leads not to fantasy, imagination, and increased self-worth, but rather to a manic dependence on appearance and consumerism. *Shopping and appearance (nails, hair, makeovers) are the main mother-daughter bonding experiences. 1. without adult female guidance, we may be "cultivating a legion of step-sisters--spoiled, self-centered materialists, superficially charming but without the depth or means for authentic transformation." 2. The prince is not the cause of Cinderella's transformation; rather, she is. And she asks the Prince to witness the woman she has been all along, and to accept her as she is. This ability for self-transformation is what we all want for our daughters after all. Orenstein has spoken clearly on topics that concern me as a mother and grandmother, and, I am sure, many others as well. This book makes concrete some of the ideas that have been puzzling or disturbing us, so we are now better able to talk with our daughters and to make wise consumer choices. I will be reading more by Orenstein. Bravo. This book opened my eyes. I highly recommend. It is also a super easy listen. A must read for moms with daughters!!! Times have changed and it is so hard to keep up. We owe our daughters a chance to survive in this crazy but wonderful world. This Book Should Be The New Parent of a Daughter's 2nd Bible! I absolutely lived this book! The information, candidness of Ms. Orenstein, as well as her i sight. I needed to hear/ read this book,as a mother of an 10 & 12 year old daughters! I only wish I would have discovered it 7 years ago. Although, We haven't done so bad and have avoided staying grounded. This book seriously is a must have for all parents (especially of girls) and educators. Thank you so much for writing this and being brave enough to talk truths. This book should be read by anyone who is raising a daughter and puts a whole new perspective on current social expectations.